We have over 38 years of experience as quality decorators. As well as offering all types of interior & exterior decorating services to both the commercial and domestic markets, we also specialise in remedial repairs and paperhanging (All types of wall coverings, including - Muraspec and heavyweight vinyls). As part of our commitment to offering a high quality service, we are trust mark registered as Dulux Select Decorators, meaning that we can offer a two year guarantee for our domestic customers. We are fully insured with public liability. We are also members of Trading Standards and the Painting and Decorating Association, as well as being members of the Checkatrade scheme, which enables new customers to view some of the feedback that we have received about our work, before deciding that they may wish to use us. 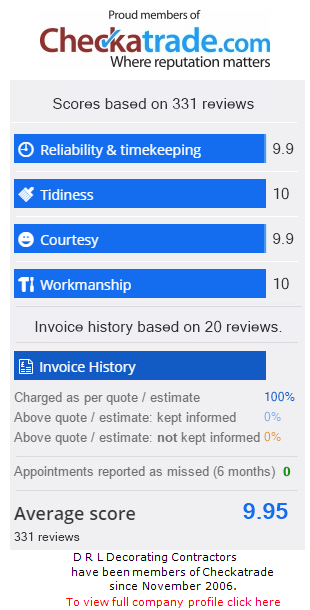 If you wish to look at feedback from past customers, you can view our Checkatrade reviews to the right. Alternatively, you could visit one of the links at the bottom of the page, these will redirect you to whichever website you have chosen; once there you will be able to read feedback and view recent jobs that we have completed; images from these jobs can also be found in the Gallery tab at the top of the page. Click through to see some of our work, or visit the Gallery to view more.